"My children, today I come to talk to you about the obedience to Me...Did you saw, My dear children, on the Messages that I've gave you during this month, how much I love you, and how much I want to help you on the sanctity path's. I invite you to an unlimited obedience to Me, thus obeying God, to Whom I am obedient, you will be obeying to Myself. My children, the obedience leads to the Holiness!...The obedience of you to Me, will bring you to the Triumph of My Immaculate Heart, which its about to come upon the world. Saints and more Saints!...Martyrs and more Martyrs!...Will lift under the very Powerful influx of the Holy Ghost, that I will breathe into them, and they will give his own life to the Church, under My sweet and maternal gaze. The Triumph of My Immaculate Heart will be the worldwide Pentecost, with the mankind prepared by Me for the Jesus Coming's...This time will be between My Triumph and His Final Coming...I don't know the date, but I know that it is close! Will be the Reward for those who pray with Me now, suffer with Me, with Me repair, and offer themselves with Me! I invite you all to kneel with Me, on "those times", for so that we achive the Victory of Jesus and of Mine!...Pray the Rosary very much for this intention! In do bless you, in the Name of the Father...of the Son...and of the Holy Ghost..."
God is so infinitely Good, which created a Guardian Angel for every one of you...He created all the Heavenly Host, for to be "carriers", between Him and you. I am the Queen of The Angels, that loves you so much, with the Angels of God!..." Note - Marcos: (The Angel Zathanye is my guardian angel, and his name means "Sun of Justice", as revealed Himself to me in one of His Apparitions, that occured by the Divine Will. God decided that He offen bring some of His public Messages, destined to all mankind, as they are narreted in this book. Several times however, He was sent by God to prepare me for some special Apparition, to help me in trouble, and for to give me comfort and guidance of the party of God, and even Our Lady. I bless you in the name of the Father...of the Son...and of the Holy Ghost..."
I AM HEAVENLY PROPHESIED OF THE LAST TIMES!...LISTEN TO ME! "My children, I am the last times Heavenly Prophiesied!...I'm sent by God to deliver to you the latest Messages to the mankind. In these time where the "black beast", the freemasory, the "new era", scatters the darkness of the lack of faith along the way, I've been sent by God to lead you to Him as soon as possible. My numerous Apparitions cannot convert at least "a third" of the mankind...Why such a lack of love My children? The Rosary is the "Great Weapon" that I give to you...My army follow guided by Me fighting the "strenght" of satan and his minions. Soon My Immaculate Heart will triumph, and the Peace will come to the world. I do bless you, in the name of the Father...of the Son...and of the Holy Ghost..."
CONVERSION: THERE IS NO MORE TIME! 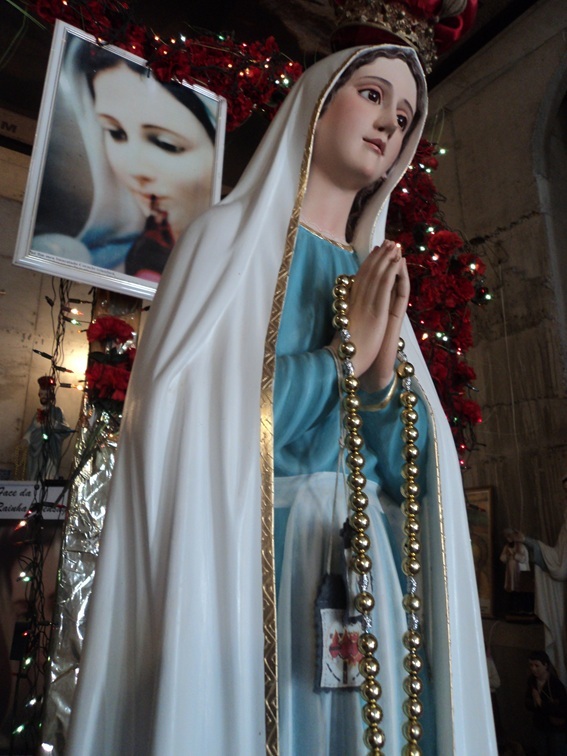 Pray the Rosary a lot, My children!...Only the Rosary and the Eucharist can save you now...Pray the Rosary every day!...Who put complete trust in Me, will be saved..."
"My children, for a long time already, I've being telling you about the consequences of your sins, currently so serious and horrific. Satan is proclaming victory in the world, because he see that are few those that face it, through prayer. My children, that's why this Message so important its about the Holy Rosary. Pray the Holy Rosary My dear children, every day. Since Lourdes I've remembered you about that My urgent and desperate appeal...after the Holy Mass that is the greatest prayer, that makes Me more closer of you...the Rosary have so much power! And that's why it is the second way that more unites you to Me. Children, now that you recognize how much I LOVE the Rosary, the Power and the Strenght of the Holy Rosary, put it in your hearts!...Pray the Rosary everyday...There is no Grace, no matter how impossible it seems that it is not gotten with the prayer of the Rosary prayed with LOVE. My children, pray the Rosary with Me, every days."